They built a TARDIS from scratch. My mind is blown. Something truly magical happened in Greenville, SC. 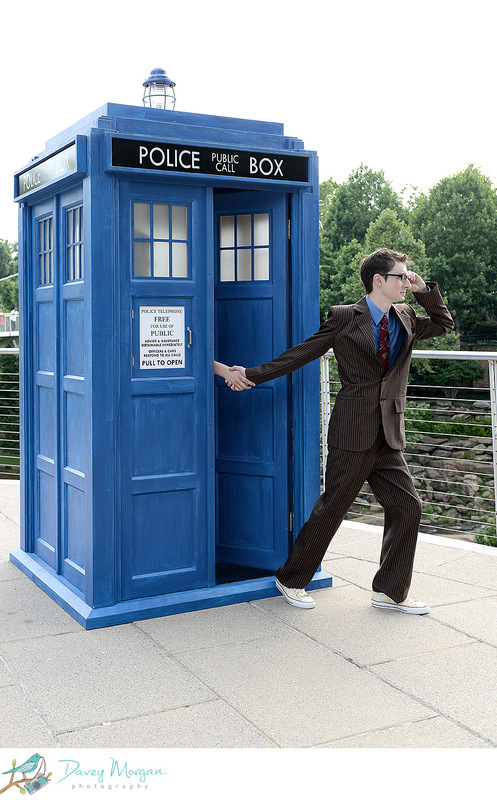 Doctor Who and his time-traveling TARDIS came for a visit! 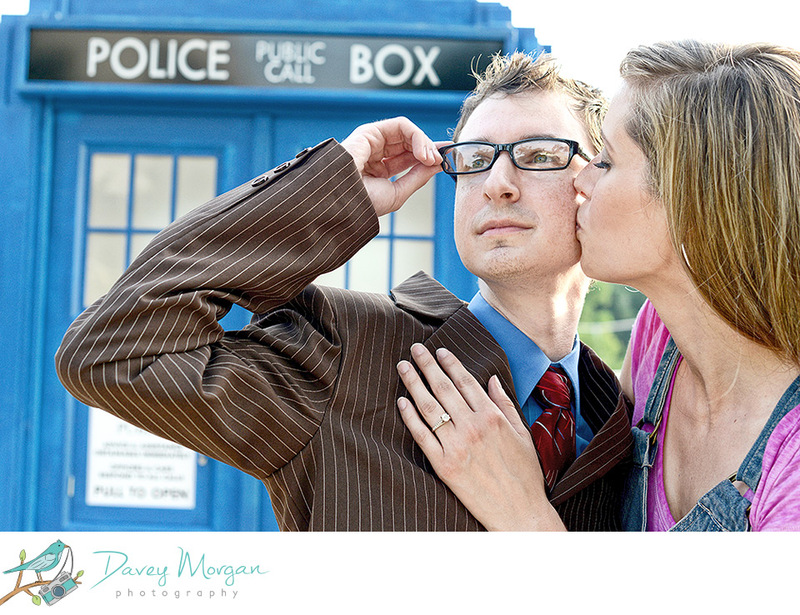 The TARDIS was photoshopped to look like it was flying by wedding photographer Davey Morgan, but the TARDIS itself is all-real. And landed on the Falls Park suspension bridge. Alias: newly engaged Justin. He was such a fan of the 10th Doctor in the Doctor Who series, that he chose to dress as the actor who played it, David Tennant. Followed by his foxy sidekick, Rose Tyler. Also known as Justin's fiance, Laurie, who based her outfit off of the character played by Billie Piper. Of course, this isn't the actual TARDIS from the Doctor Who series, but Laurie's father built this one from scratch, with working lights and all the details! The TARDIS here, like their outfits, is based off of the 10th Doctor. Laurie's father built it to make their themed engagement photo shoot really special. The couple had been dating for 5 years before Justin popped the question. But Laurie obviously said yes. After all, how could you say no when the ring is on a sonic screwdriver? And you're promised a series of adventures with a dashing British doctor? Where your mission is to travel around the universe, exploring space and time? And you get to save whole civilizations, and fix countless wrongs?! I have a sneaking suspicion that this fantastic engagement shoot isn't the only adventure Justin and Laurie will go on. Congratulations to this amazing couple, and to see more of the beautiful photos from this shoot, check out Davey Morgan's photography blog.